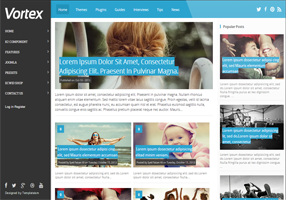 Vortex is a 100% responsive, high functioning and multimedia magazine style blogger template designed for richly professional bloggers and webmasters. It has some efficient features and functionalities that would certainly make you go gaga about this template. Most importantly, this template looks different on each and every device. For example, check it on your PC, Laptop, iPad and even your smartphones you will find all layouts a slight different from others, we call it the excellent designing.